The sidra we read this Shabbat is about leprosy. The sages gave it a new dimension when they said that m’tzora, a leper, suggests motzi ra, a person who indulges in evil talk. A pertinent illustration of the sin of evil talk comes in a story about the great Chafetz Chayyim. The stranger became irate and slapped him across the face. 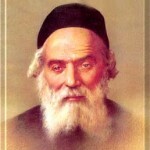 The Chafetz Chayyim said nothing but continued with his walk. When he got home he found the stranger sitting in his house, waiting to talk to him. When the visitor realised that the man he had slapped was the great Chafetz Chayyim himself he was so upset that he fainted.